Sometimes we get so busy in the Christmas season it’s hard to actually enjoy Christmas. That's why I want to look at the Christmas story in July. Maybe now, in the middle of summer, you may see/hear Christmas a little differently. Last Christmas, I was studying and preparing for a sermon, when I discovered a fascinating insight in William Barclay’s commentary on the Gospel of Matthew. It did not go with my message at the time, but I set the idea aside specifically for “Christmas in July.” So this message has been over 8 months in the making and you are reading it today for a reason. I pray you will listen to what the Lord is saying specifically to you. Sometimes it takes an outsider to see something everyone else takes for granted. The Wisemen in our story were outsiders to the Holy Land. Also known as Magi, these men were probably astrologers from what is now modern day Iran. They spent their life studying the stars and planets for omens to predict important events on earth. The Wisemen saw something so phenomenal it inspired them to take a journey of thousands of miles on foot (or camel). It would have taken months to make the trip to see the child they believed was born King of the Jews. It would have required numerous stops along the way for rest, resupply, bathroom breaks, and maintenance (you know you have to change the oil in the camel every three months!). All this for a “King” you never met before, but only read about in the stars. How far would you go to meet Jesus? Obviously, the Wisemen had high hopes for this new king. By the time they arrived in Jerusalem, the Wisemen expected everyone to know about the momentous birth of their “New King.” And yet, no one seems to know anything about Jesus. And as the Wisemen tell what they have seen in the stars, the people in the story soon gather into three different groups according to how they respond to the news of Jesus birth. And ever since Jesus came, people have found themselves in the same three groups according to how they react to Christ--people are either disturbed, disinterested, or deeply devoted. There is a loud voice crying out in our world today that says we deserve to live as we please—that we have the right to satisfy our desire—even if it goes against God’s Word and natural design. The same misguided voice proclaims that to deny ourselves is unhealthy, a denial of our individuality, and to be inauthentic and untrue to ourselves. But Christ says, “Whoever wants to be my disciple must deny themselves and take up their cross and follow me.” In time, as Christ heals our selfish hearts, we may find that we come to love to do what Christ likes. But it is often not so in the beginning. You may be disturbed by Christ because you fear he will interfere with your life. Are you going to embrace him and let him change you, or are you going to try to destroy and silence him? 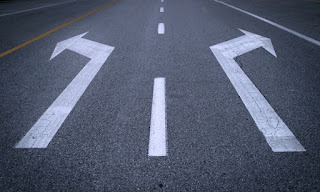 Some people are disinterested in Jesus; they don’t care one way or another. The scribes and chief priests were so engrossed in their politics, their “religious” rituals, and their legal disputes, that they completely disregarded Jesus. He meant nothing to him—except only to the extent that news of Christ’s birth disturbed their king Herod’s fragile personality which in turn disrupted their own status quo. Sadly, it often is not until same terrible tragedy comes in a person’s life that they will become interested in Jesus. When cancer strikes or a love one dies unexpectedly, then suddenly people begin to cry out to a God they had little interest in before. I am a kind person, but I find myself in a strange place sometimes—praying for people who are deeply disinterested in Jesus. Sometimes I must pray for God to send trials and tribulations that are trying enough to shake people out of their apathy so they will become interested in Jesus before it is too late. Are you one of these disinterested people? What will it take to wake you from your spiritual slumber so you recognize your deep need for the love and power of Christ? I pray it will not take some terrible tragedy. Why not turn your thoughts and interests to him today? The Wisemen presented gifts of gold, frankincense, and myrrh. But what Christ wants from you is your heart. Which type of person are you today? As you react to Jesus, are you deeply disturbed, deeply disinterested, or deeply devoted? Now is the time to decide. Now is the time to respond. While I was out of town on vacation, Pleasant Grove's totally awesome music minister, David Crawford, preached about how to be a cool Christian. He graciously agreed to let me share his message on my blog today. Enjoy! Romans 12:2 - Do not conform to the pattern of this world, but be transformed by the renewing of your mind. Then you will be able to test and approve what God's will is--his good, pleasing and perfect will. When I read this it makes me wonder about how we “fit in” with society. I mean if we are to have enough influence to persuade someone that they should give their life to Christ, then surely they must respect us as a member of society, or at least their social circle. And our influence within society, or our social circle, will be greater if we don’t appear to be strange, odd, out of sorts with reality, or lost in space. I would think we need to have a modicum of normality, and perhaps even a bit of “cool” if we are to persuade someone else they would benefit from being more like us with regard to living out our Christian beliefs. 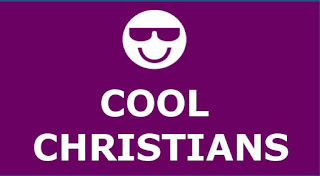 So, can one be cool and Christian at the same time? If not sooner, then usually by middle school, we all start noticing where we fit in socially, and most of us would like for the people we are around to think that we are “cool”. We want to fit in, and be accepted. And while the awkwardness of adolescence and our mission to be popular or cool doesn’t last forever, we always want others to respect who we are and what we are striving to be. While it may not be our main focus, even now, we want those with whom we associate to think we are cool. 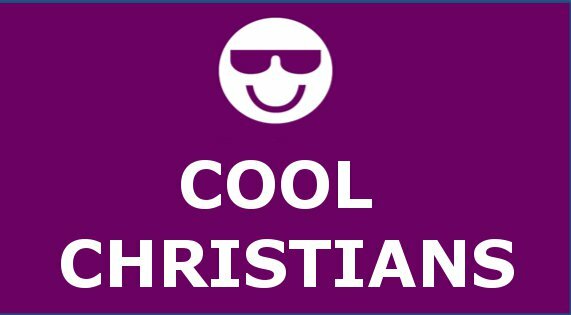 So how do we reconcile being cool, with being a Christian? Are they at odds with one another? This wasn’t exactly the direction I felt pulled in, so I abandoned the hipster Christian train and searched, instead, for how to be cool. I wanted to see what a secular site had to say about how to be cool. I found a wiki (I feel cool just saying the word "wiki") on how to be cool in school, and I thought I’d see if their advice was reconcilable with my Christian beliefs and ideals. I picked six of the steps to share with you today. I think you might be surprised, I was. Secular Coolness Step 1: Don’t just think about it — do it. It’s all very well to read books and blogs about self-improvement, but you have to actually get out there and apply the theories that resonate with you. Let’s replace a few words there and it reads like this instead: It’s all very well to read the Bible, but you have to actually get out there and apply its teachings. Secular Coolness Step 1 continues: Do it! It’s scary but so, invigorating. Who knows who you’ll meet and what they might be able to offer you? Stepping out can be scary. Expressing your opinion on a subject, especially religion, can open you up to ridicule and you risk a piece of your pride, but it is worth it, and while the first step to secular coolness ends with what you may gain from putting yourself out there, as Christians we must deviate a little from their script and I would challenge you to imagine what the people we share the good news with will gain, and perhaps scariest of all, what the people we do not share the word with may lose. Thinking things through before jumping the gun is a great trait. But thinking things through and then not doing anything won't get you anywhere. So the first step in secular coolness is to take action. And a major component of our Christian faith is to take action. Secular Coolness Step 2: Be yourself. It will be something that other people will look up to. You are unique, and you don't need to join a clique. Make your own friendships. Don't try to be like anyone else by copying someone else's moves or act. Live life for who you are. Don't lose sight of yourself or your morals. Being cool isn't about changing who you are, its about being confident enough to let people see how awesome you really are. My dad always said, “Be who you is, ‘cause if you be who you ain’t, then you ain’t who you is.” But sometimes we don’t feel like we are awesome enough to be “cool”. Not a problem, because Psalm 139: 14 and 15 says, "I will give thanks to You, for I am fearfully and wonderfully made; Wonderful are Your works, And my soul knows it very well. 15 My frame was not hidden from You, When I was made in secret, And skillfully wrought in the depths of the earth..."
Secular Coolness Step 3: Speak up. Observe people who are "cool"; they usually speak confidently and clearly, at a good pace. They don't chatter rapidly, pause, say uh, um..., or mumble. They say what they mean, and mean what they say. Be confident in your word and don't let anyone try to change it. If you state your opinion and people disagree, don't worry. Say what you feel and people will respect you for that, unless you say it knowing it will offend someone. Don't shout out your opinion just to be heard. Make sure it's relevant, and be ready to back it up soundly. If speaking up and speaking confidently is cool, then I believe Paul is one of the coolest people in history, because Colossians 4:3 says, “...praying at the same time for us as well, that God will open up to us a door for the word, so that we may speak forth the mystery of Christ, for which I have also been imprisoned..." Yep, you heard that right, he was in prison for speaking the living word, and while in prison he was praying he would get the chance to speak the word again to someone else who needed to hear it. I also like what the article says about people disagreeing with your opinion: the article says, “don’t worry.” I think sometimes we feel like if we speak about our faith or share the living word, and we are rejected or rebuffed, then somehow we have failed. NOTHING COULD BE FURTHER THAN THE TRUTH. We plant the seed. God makes it grow. Secular Coolness Step 4: Keep your "cool". The very definition of cool is being calm, composed, under control, not excited, and socially adept. This is especially true right now with so many highly controversial issues blazing through our society. There are people out there who will purposefully try to “get us going” when they find out we are Christians. They try to “set us off” by “setting us up” with questions about these controversial subjects. It is our job to remain calm. Know what we believe and be able to back it up with scripture, doctrine, and our beliefs. It is also ok to admit that we may not have the answer, but we trust in our God and know He is in control. I would say that most, if not all of us, have been fired up by someone pushing the right buttons, but if we can remain cool, it will be more apparent that we have faith in someone bigger and more powerful than all of our problems. And according to Proverbs 15:18, "A hot-tempered man stirs up strife, but the slow to anger calms a dispute." So there must be something to staying cool. Secular Coolness Step 5: Have faith in your friends. There’s a reason they hang around you. The personality traits you may think make you socially awkward, may be the very quirks they find endearing. If you want to be cool, then you have to believe that the people around you genuinely like you and find your relationship meaningful. Remember that it's not cool to hang out with people who you think are cool just because you think it'll make you cool by proxy. Life doesn't work that way. Another aspect is to consider the people who make up your social and work related circles. We have all been given gifts and abilities that we use to help build God’s kingdom on earth, as well as make a living within our community. Those gifts and interests have drawn you to a certain group of people and similar people are drawn to you because of your gifts and abilities. Contractors don’t always run in the same social circles as ballet companies. Because we are varied in our interests and abilities we have a chance to reach a multitude of people from very diverse social circles. Embrace where you are and look for opportunities within your circle to witness through your actions and when the occasion arises by sharing words of faith. The friends who make up your circle will be there for you. After all, they are your friends. Secular Coolness Step 6: Don't be afraid to be different. Whether that means defending someone else, or taking interest in something that no one else does, like playing an instrument, try to be different and stand out. (16) The coolest people are the ones who occasionally break against the tide and make people question the status quo. Take that last statement and change coolest to Christian. The Christian people are the ones who break against the tide and make people question the status quo. Most of us have been involved in that conversation. You know, the one where everyone seems to be agreed in a course of action, or an opinion is shared by the majority; and then there you go having to interject your Christian morals and beliefs making everyone reevaluate their position. It is not always met with kindness, instead it is usually met with exasperated sighs, but it is the Christian thing to do, AND it is cool when you are part of redirecting a situation onto a Christ-like path. So, can you be cool and be a Christian? I don’t think you can be a Christian without being cool. One of the online dictionaries defines cool as fashionably attractive or impressive. As I look out on the congregation I don’t think we need to worry about fashion or attractiveness, ya’ll are a pretty good lookin’ bunch. So I think we are talking about cool being impressive. And there’s really no denying Jesus was impressive. He calmed the storms, He turned water into wine, He healed the sick, raised the dead and saved the entire human race. That’s impressive, that’s cool, and that’s who promised to be with us through the gift of the Holy Spirit. We walk with Jesus because we are Christians. Because we are Christians we strive to be like Christ. We are most like Christ when we are least like ourselves and we surrender our body to the will of God. And in those moments we are cool and it is cool. Not because of who we are or what we do, but because of whose we are and what He can do through us for the rest of the world. Since I didn't preach a sermon at church yesterday, I thought I'd share something I wrote a couple years ago as I was grieving for a family that left my church because they disagreed with the United Methodist Church's stance on homosexuality. This was what was in my heart and remains on my heart for the family and others like them. You don't understand how far I would go for you. cry with you, dance with you. But I can't call what wrong right for you. I can serve you, worship with you, put you to work and work for you. pray for you, be prayed for by you. But I can't call what's right wrong for you. unite my heart with you, commune with you. I can study with you, learn with you, teach you and learn from you. I can lean on you, fight for you, suffer for you and die for you. But I can't call what's wrong right for you. And I won’t call what’s right wrong for you. Last week, we enjoyed a great time with a wonderful group of kids at Vacation Bible School at Pleasant Grove UMC. Each evening, we began with an assembly where we said the pledges of allegiance to the American flag, the Christian flag, and the Bible. That got me thinking about the Christian flag and where it came from. So I did a little research and thought I would share what I found. The following excerpts are from Wikipedia.com. 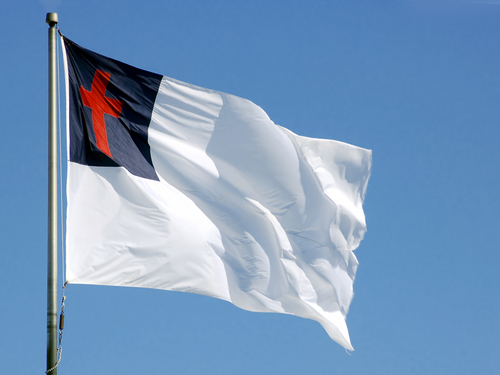 The Christian Flag is a flag designed in the early 20th century to represent all of Christianity and Christendom, and has been most popular among Christian churches in North America, Africa and Latin America. The flag has a white field, with a red Latin cross inside a blue canton. The shade of red on the cross symbolizes the blood that Jesus shed on Calvary. The blue represents the waters of baptism as well as the faithfulness of Jesus. The white represents Jesus' purity. In conventional vexillology, a white flag is linked to surrender, a reference to the Biblical description of Jesus' non-violence and surrender to God. The Christian Flag was first conceived on September 26, 1897, at Brighton Chapel on Coney Island in Brooklyn, New York in the United States. The superintendent of a Sunday school, Charles C. Overton, gave an impromptu lecture to the gathered students, because the scheduled speaker had failed to arrive for the event. He gave a speech asking the students what a flag representing Christianity would look like. Overton thought about his improvised speech for many years afterward. In 1907, he and Ralph Diffendorfer, secretary of the Methodist Young People's Missionary Movement, designed and began promoting the flag.